Performers include: Jay North, Herbert Anderson, Gloria Henry, Joseph Kearns, Sylvia Field, Billy Booth, Gale Gordon, Jeannie Russell, George Cisar, Sara Seegar, Robert John Pittman, and Irene Tedrow. Based on the Hank Ketchum comic strip of the same name, this show tells the story of Dennis Mitchell (Jay North); a sweet five-year-old boy with a knack for getting into trouble. 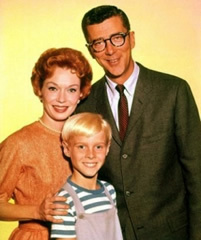 Dennis’ parents, Henry and Alice (Herbert Anderson and Gloria Henry), do their best to control Dennis but it’s usually poor neighbor George Wilson (Joseph Kearns) who takes the brunt of it. Dennis’ friends include Mrs. Wilson (Sylvia Field) and playmates Margaret Wade (Jeannie Russell) and Tommy Anderson (Billy Booth).